As you know, in the past few days we have seen very devastating news where Typhoon Haiyan hit several countries. Typhoon Haiyan is known as the strongest storm that ever happened and it has been reported to cause more than 10,000 death and more than 9 million people are affected. At the moment, there's no electricity, no water and no food. And they need our help. I am Jammeh Resident, the owner of T o r o and I am Filipino. I am very devastated to see my friends, my family and fellow Filipino affected by this awful disaster. I am currently setting up a fundraiser to help our fellow Filipinos through this hard time. Donation will go directly to the International Red cross in the Philippines. We are inviting each of you to donate 1 or 2 items to help this cause. Any items as long as it is yours would be acceptable. Please return this application in a note card to Jammeh Resident before November 13th - mid SLT. - Picture templates where you can add the images of items that will go on sale. We will post this picture to our flickr groups, website, facebook page and inworld groups. 3, You will be invited to Typhoon Haiyan Fundraiser group. Please note that all proceeds that go to TyphoonHaiyan Resident will be posted to our website and it will be transparent. If you are not able to donate 1 or 2 items, you can still get a donation box that can be placed at your store and is only 2 prims. 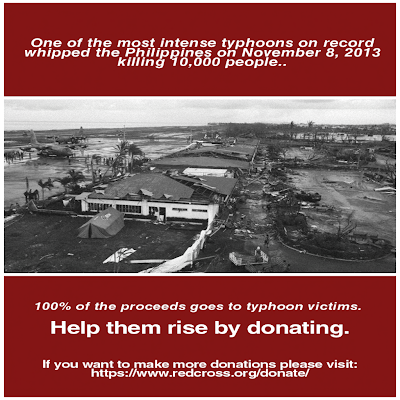 Remember that only 1L will help the victims of Typhoon Haiyan. Feel free to contact me, Jammeh Resident , if you have any question.